This topic contains 11 replies, has 3 voices, and was last updated by Duo_Liang 1 month ago. I am getting again and again the following error during sending document to esign. is there any rule or standard for keeping space between multipart boundary when sending the document binary. Please find the attached file for the request sending to esign. This topic was modified 2 months, 1 week ago by kartik_shivhare. Your attachment wasn’t uploaded successfully, you can use .zip format instead of .7z, or simply you can send it to developer@esignlive.com. Per the 65533 error, it could because of your request structure, as previous thread mentioned. This reply was modified 2 months, 1 week ago by Duo_Liang. I have mailed the request text file when sending the request. fiddler is not able to capture the https traffic. we are requesting the https request from the server side. What can be the issue if i am sending the two file of different extension it is working fine but not with the two or more pdf. is there any type of encoding standard you gyuis are using for the document binary conversion. we are using default encoding suggested by your side. I have sent you the request of Api from email :- rahul.rathore@crmnext.in yesterday. Although I have compared both working and non working request it seems like both are same. please look into the request file mailed to you. Does the same code works at your local developer machine? 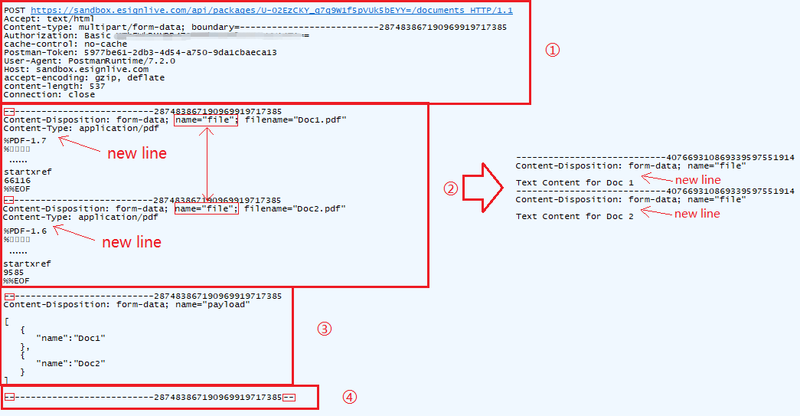 Can you also share the HTTP request content for “sending the two file of different extension it is working fine” case? By directly reading your request file(after some minify and unescape handling), I can’t reproduce the same 65533 error but another error related to documentPreverifyError, so if possible, could you also send your PDFs without sensitive information to the developer@esignlive.com? The request content has already been shared with you but we will send you the request via email which is successful from a standalone project. There is no visible difference between the two request content ; only difference is that in standalone project , we are invoking the same piece of code from an .net aspx page but the unsuccessful request is from our main application which is getting triggered from .net mvc controller action . We have also shared the pdf files with you over the email. please let us know if there is any difference or how we can find out the cause of the problem. piece of code , corrected , the same and problem got resolved. Glad that you found the solution! I am trying to create the package for e-signing. I am using Apache Wink in Java environment. I am using BufferedOutMultipart to send the multipart/form data for pdf and payload json. The Payload json is sent as String format. After a quick test use Apache Wink RestClient to make a POST (/api/packages) request creating a new package (Ca Sandbox), the code in this code share works properly at my side. Please kindly try this code sample with my example payload first to see whether it’s a payload issue or code issue or potentially an API issue because there was a new release(11.24) on Canada Sandbox these two days. Thanks Duo for the help. It is working now. Apparently it was the headers and the boundary mismatch with my code. This reply was modified 1 month ago by sumantasaha.